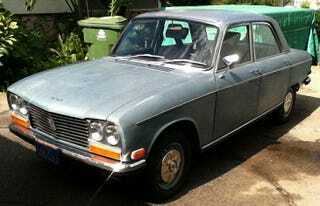 For $3,900, Does This 1971 Peugeot 304 Belong Behind Velvet Ropes? Doing his best Dr. Jones impersonation, the seller of today’s Nice Price or Crack Pipe Peugeot 304 says that it belongs in a museum. Will his price however prove a worthy entry cost for you to see-um? On Friday we celebrated all things America in honor of our Independence Day, which in fact fell on Saturday. Well, we didn’t celebrate everything, we pretty much focused on a 1977 Ford F150 pickup truck that seemed to embody the American spirit, but unfortunately for its seller, not our great nation’s sense of frugality. We’re not buying military toilet seats here, and as such it fell in a substantial 75% Crack Pipe loss. In case you haven’t yet seen it, or had your innocence stolen from you by reading about it second hand, a week ago Sunday the BBC aired a cobbled-together final episode of the 22nd season of the CHM Top Gear. Unbeknownst to me, that episode would feature, among other things, a Vauxhall sport utility driven - and dissected - by Jezza. We then inexplicably had the Isuzu progenitor of that car here the very next day. Coincidence? I think not. Kismet? Maybe. Well, that episode, halfhearted and half-assed as it was, featured a number of other cool cars and seeing as it’s another Monday, let’s have a go at yet another one of them. This 1971 Peugeot 304 is the sedan, and not the twee convertible chosen by James May in the show, but it’s close enough that you shouldn’t be shouting cocking nora at the difference. Seriously, don’t say that. The 304 was introduced in 1969 as an entry into Europe’s mid-size family car sector. It was developed off of the smaller 204 platform and featured clean Pininfarina styling that from five yards away could easily be taken for an Audi Super 90. Europe got big dead-eyed glass blocks for headlights on the 304, while here in the U.S. we got Federally mandated sealed beams, a quartet of which in fact that actually gives the car a face. Out back, these early cars got a set of four diamond-shaped tail lamps which nicely match up with the heads in front. This one seems to be complete, but wholly original with little apparent work having been done over the years. That’s resulted in a car that carries a patina of age, but at least not one of imminent structural collapse. Yeah, the paint’s worn through in places, but at least the steel isn’t. The seller seems pretty willing to show the car’s warts, providing pictures of, among other things, the scabby floorboards under the mats. Honestly, if I were buying this car, my first purchase would be a quart can of POR15. The engine compartment however, is remarkably clean and tidy. There resides a 65-bhp SOHC 1,288-cc four and a four-speed gearbox. They both live together - Mini-like - sharing the same lubrication, so also like a Mini, rigorous oil change schedules are demanded. As you might recall, the modern side-by-side FWD drivetrain was only being put into use by Autobianchi and its parent Fiat at time of this car’s introduction. Notable features of the 1300 are its hemi-head design, and the fact that, like on a Corvair, the fan belt is forced into a torturous path owed to the radiator facing forward and the spinny parts of the engine facing sideways. The interior looks somewhat tired, and good luck finding a replacement dash cap for the current cracked item if you don’t speak French. The headliner looks intact, as do the seats and door cards, so there is a lot to like in here, including the cool Peugeot-branded AM radio, and headrests that make the seats look like upside-down barber’s chairs. That might shed light on the “Belongs in a Museum” comment, and may make getting this cool old Pug legal for the road a bit of a challenge. Still, it’s not like it’s wearing an ankle bracelet and under house arrest, the title can be changed, right? I mean, what’s James May to drive if he comes over to you house and wants to go and find a proper pub? Of course the question we’re most interested in is whether the hassle - and the potential May Day opportunity is worth $3,900. What do you think, is that worth the challenge? Or, do you find both the price and the issues re-Pug-nant? H/T to Jonee for the hookup!